Many are surprised at the violations of human rights in Norway. It is hard to understand that a country known for humanity and democracy acts in inhuman ways towards its own citizens. However, Norway is a society with [a] focus on equality. A welfare state has been created which aims at eradicating differences and social dividing lines. In the wake of this initially positive process, an ideology has developed with scant place for deviation and a demand for uniformity allowing little room for being different. The authorities tend to define as negative all circumstances departing from a defined, allegedly optimal, mean. This attitude shows clearly in the child protection system, where everything deviating from a textbook standard is counted as potentially harmful to children. Such extreme idealization of equality will often single out newcomers to our country, who grew up and have their roots in [something] other than Norwegian culture. Foreigners are furthermore even less than the rest of the population able to defend themselves against attacks from the authorities. 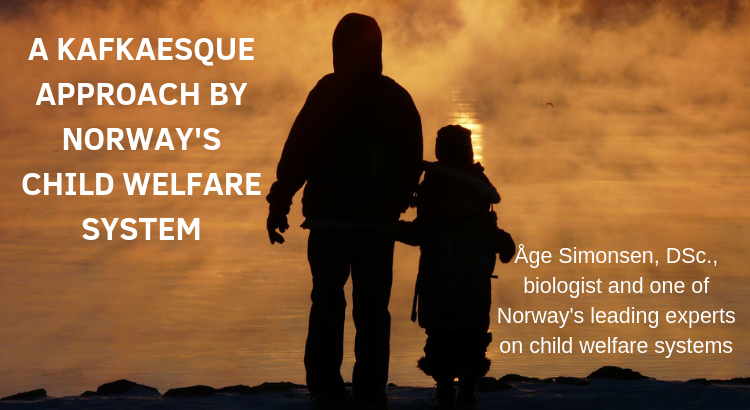 The attention of Norwegian CWS authorities is not only on how adults raise and treat their children but equally on parents’ general appearance, behaviour and reactions. Such characteristics are different in foreigners from what they tend to be in Norwegian-born subjects indoctrinated through the school-system and taught to fit in with more or less firm conceptions of normal and accepted conduct in Norwegian society. Research surveys show that in 75 per cent of CWS cases, problems and behaviour which the CWS claims the parents to have are given as the cause for taking small children into care. Only 6 per cent of the cases were based on the children’s problems. If the authorities get the idea that something is not normal in a family (in the sense of “normal” described above), the CWS starts an investigation of the family. The parents’ personalities are measured relative to the norm. The method often used consists in describing parents’ background, personality and relationship to their children in terms of a series of so-called strain indicators or risk indicators, such as immaturity, psychological problems, psychosis, psychic retardation, alcohol and drug abuse, and other possible deficiencies and departures from the normal. The lives of the parents are analysed into categories. Along with several other factors, complications such as pelvic distortion in pregnancy and deformities in the child are counted as risk indicators for later failure to care for the child. Parents’ alleged self-esteem as an indicator is given great importance, in spite of the lack of scientific evidence for any correlation between self-esteem and child abuse. In California the state administration had a research group investigate how important problems could be solved by “increasing the self-esteem of the population”. This task force went through 65,000 research articles in psychology dealing with self-esteem. The result was published in the book, The Social Importance of Self-Esteem, in 1989. The chapter dealing with child abuse and care failure concludes that there is no documentation for allegations of any connection between low self-esteem and child abuse. The team found no basis for claiming that higher self-esteem would reduce abuse and neglect of children. Nor was any connection found between low self-esteem and aggression or violence… Although, several hundred studies surveyed showed no such correlations, our CWS still claims that there is a clear correlation between failure to give care and low self-esteem, which therefore counts as a risk indicator in assessing whether children are to be deprived of their parents. Immigrants in Norway are often branded with “low self-esteem or lack of self-confidence” through the attitudes they are met with in Norwegian society. This alleged risk indicator is therefore liable to be salient in this section of the population. To work out an assessment of the parents’ ability to give care, they are observed by social workers in their home. Unfortunately, it is rarely possible to check what kind of methods of observation are used. Several problems follow. Since observer and observed are living individuals who influence each other and each with attitudes and prejudices, “observation” is no clear-cut activity and this objectivity question must be taken into account. Such problems are standard and have to be accounted for in any methodologically acceptable study in any social science. They do not seem to be, though, in the view of CWS personnel. Their observations do not take place under natural conditions but in situations where those being observed are nervous, upset, or for other reasons cannot be expected to behave naturally. These confounds are ordinarily not mentioned in the CWS reports, nor are observers’ effect on observed discussed. In many cases these deficiencies have led to misinterpretations which have contributed to creating the case for CWS intervention. For the CWS to find so-called risk indicators in parents’ lives back to their childhood, the parents are subjected to more or less “clinical” interviews and observations by psychologists chosen by the CWS. The psychologists come up with prognoses for ability to give care, future care failure, relapse into psychiatric illness, etc. Such predictions based on interviews have turned out to be problematic and in [the] USA several studies have shown them to be largely incorrect. Around 80 per cent of the CWS’s decisions to take children into care were based on claims to have diagnosed deficient parental ability to give care, so that there might be a care failure sometime in the future. In only [a] few cases was [a] present care failure documented. In no case was there any documentation of actions that could be labelled child abuse. There were statements and accusations by the CWS against parents which, when investigated, turned out not to be true. An example is that of a mother who had a spot on her cheek when she came to a meeting at the CWS office. The CWS records this in their file. By the time a report arrived on the municipal committee’s table, the CWS has changed it to a black eye (insinuating violence in the home). In another case, a social worker writes that the mother drank and that one should find out whether the father has alcohol problems also. Later in the same report, written on the same day and with no investigation having been carried out, the social worker claims that the father drank a lot. In yet another case, from a neighboring district, the mother, being interviewed about her childhood (no doubt for the purpose of finding “risk indicators”, cf above), had said that she had as a girl had a fine summer holiday at a summer camp for children at Hjellestad outside Bergen. In the report, this had been changed to a statement that she had been treated at the Hjellestad clinic (an institution treating people with problems relating to alcoholism and drug abuse). The CWS wants to control every aspect of the lives of a foster child, to make sure that it follows the plan they have drawn up. Since the CWS considers frequent contact with biological parents to be negative for children’s “attachment” to new “care givers” once they are placed in foster homes, the right for parents and children to meet is cut down to a minimum and the plan is for the children to remain in foster homes until they are grown up. The need for control means that other close relatives are not considered as foster parents, except in cases where the fosterers are made to consider the biological parents enemies. In sum[mary] there is reason to say that CWS methods are more than criticisable and have a very poor scientific basis. It is abundantly clear to me from my experiences on the municipal committee and from research literature that the Norwegian child welfare service does not serve the population with welfare in the humane and competent way intended by the law and by international conventions Norway has signed.